Recently, the legal publishing company Fastcase received a takedown notice from the parent company of another publishing company, Casemaker, claiming they had exclusive rights to distribute, for commercial use, the Georgia Administrative Rules and Regulations. Fastcase CEO Ed Walters was surprised by this demand, because public law is not copyrightable. As a response, Ed decided to initiate litigation with Casemaker for the rights to the regulations and also to set a countrywide precedent. But why did Casemaker think they had exclusive rights to these Georgia laws in the first place? In this episode of The Digital Edge, Sharon Nelson and Jim Calloway interview Ed Walters about the case, why he thinks keeping public law in the public domain is so important, and the history of law citations, annotations, and publication. Ed Walters is the CEO and co-founder of Fastcase, a legal publishing company based in Washington D.C. Before working at Fastcase, he was a lawyer at Covington & Burling in Washington D.C. and Brussels. Ed also teaches The Law of Robots at Georgetown University Law Center. Advertiser: Welcome to The Digital Edge with Sharon Nelson and Jim Calloway. Your hosts, both legal technologists, authors and lecturers, invite industry professionals to discuss a new topic related to lawyers and technology. You’re listening to Legal Talk Network. Sharon D. Nelson: Welcome to the 99th edition of the Digital Edge, lawyers and technology. We’re glad to have you with us. I’m Sharon Nelson, president of Sensei Enterprises. Jim Calloway: And I’m Jim Calloway, director of the Oklahoma Bar Association’s Management Assistance Program. Today our topic is The Law is Not Copyrightable: Fastcase Sues Casemaker. Sharon D. Nelson: Before we get started, we’d like to thank our sponsors. Thanks to our sponsor, Scorpion, which delivers award winning law firm web design and online marketing programs to get you more cases. Scorpion has helped thousands of law firms just like yours attract new cases and grow their practices. For more information, visit ScorpionLegal.com/podcast. Thanks to CloudMask which offers cost-effective and efficient data encryption for law firms, whether large or small, in Google Apps, Office 365 and other Cloud solutions. Sign up now for your 60 day free account at www.CloudMask.com. Thanks to Serve-Now, a nationwide network of trusted, prescreened process servers. Work with the most professional process servers who have experience with high volume serves, embrace technology, and understand the litigation process. Visit ServeNow.com to learn more. Jim Calloway: We are happy to welcome as our guest, Ed Walters. Ed is the CEO and co-founder of Fastcase, a legal publishing company based in Washington D.C. Before working at Fastcase, he was a lawyer at Covington & Burling in Washington and Brussels. He teaches The Law of Robots at Georgetown University Law Center, which is probably the first time it might be entertaining to go back to law school. Thanks for joining us today, Ed. Ed Walters: It’s my pleasure, Jim. Sharon D. Nelson: So, Ed, I think Jim and I came around to the idea of asking you to be our guest when we saw in the news that you sued Casemaker in federal court in Georgia asking the court to declare that private publishers can’t copyright or otherwise own public law. So how did that suit come about? Ed Walters: Well, just before Christmas of 2015, we received a takedown notice from Law Writer, the apparent company of Casemaker. And they hired an outside lawyer to write a demand letter to us and the letter basically said Fastcase publishes the Georgia administrative rules and regulations. And we have an exclusive contract with the secretary of state of Georgia saying that only we can distribute them for commercial use and therefore you need to take them off of the Fastcase site or we’ll sue you. Fastcase has a member benefit deal with the State Bar of Georgia. We make Fastcase available for free to all the members of the State Bar of Georgia. And in those libraries, we include the Georgia administrative regulations. These are the administrative rules of Georgia, covering everything from banking to campaign finance to consumer protection. It’s an important part of the benefit. So we were very surprised to receive a takedown notice under lawyer’s letterhead threatening to sue us if we don’t remove the Georgia regs from Fastcase. Jim Calloway: Was that all that they were asking for in the takedown notice or were there other things involved? Ed Walters: No, they really wanted us to just remove that one library. And this was a surprise to us because we have a relationship with Casemaker, we work with these guys quite a bit; we’ve known them from years. It was a surprise to get a letter from their lawyer demanding that we take down the Georgia regs. But I think the bigger surprise to us was that there was some sort of exclusive use of public law that we couldn’t somehow use the law in Fastcase, that it was somehow owned and controlled by Law Writer and the secretary of state of Georgia. Sharon D. Nelson: So were they saying that they had a copyright or that you were violating a contract? What was the basis of their demand? And I realize there may be more than one. Ed Walters: Yeah, it wasn’t super clear. The letter basically said we, Law Writer, have a contract with the secretary of state of Georgia and because we have that exclusive contract, we’re the only ones who could use it. That could be a copyright suit saying that the secretary of state of Georgia has an exclusive copyright on the Georgia regulations and as the exclusive licensee of that copyright, we’re the only ones who could use it. Or it could have been some sort of contract claim saying that because there is an exclusive contract, we are acting somehow in violation of that. But it wasn’t explicit in the letter. There wasn’t any sort of explicit legal basis in the claim which makes it doubly curious. Sharon D. Nelson: It sure does. Jim Calloway: Yes, it’s very interesting. So you had the demand letter in hand and as lawyers, we all appreciate their several responses to that. You can offer to pay them money or you could take the Georgia regulations down or you could wait to be sued. Why did you decide to initiate the litigation? Ed Walters: We have been advocating for a number of years now that public law should be in the public domain, and there’s a lot of law that spells that out. Some of our first copyright cases in the US Supreme Court were about public law being uncopyrightable. And typically, the way we always try to do this at Fastcase is if there is something editorial or proprietary that is written by a private publisher, we always respect that copyright. But we’ve also been on the record for many years saying that public law is not one of those things. Public law is always known to trust by the people and you can’t copyright it. The copyright office itself says in its guidance that they won’t allow copyright for public law. So we’re sort of at a crossroads here. You can imagine things going one of two ways: We could be on the brink of an era of a really golden age of open law where data.gov and the federal government and a new wave of openness and state legislatures leads to 100 years of open law where people make the law more open and more available to people than ever where you have entreprenuers and competitors building all kinds of neat, unexpected products on top of it. Or we could be right on the cusp of the other way which is that states increasingly pressed with budgetary concerns turn to outside publishers to cudify or collect or publish their law. And in order to save money, grant them some sort of exclusive franchise. We could be on the cusp of an age where more and more law is cordoned off or copyrighted by private publishers. And that really led us to say this is a time to stand up. Instead of docking the issue or paying some fee that will allow Fastcase only to use it, it’s time to stand up for the principle that public law is owned by all of us. No one can copyright that law. It doesn’t matter what exclusive contract anybody has with anybody else. There’s no exclusivity in public law. Georgia regulations are a great example of that. Even if you have a contract with the Georgia secretary of state, you can’t create a private contract copyrights that you can’t get through the copyright law. So that was really what was at stake for us. We really said it’s time to stand up and it’s time to establish in federal court that there isn’t any copyrightability of public law. That public lw is always owned by everybody. Sharon D. Nelson: So obviously this isn’t just about the Georgia regulations and you’ve kind of stated what you believe is at stake here. Is there anything you want to add to that? Because it seems to me that there are hundreds of years of case law saying that federal laws and judicial opinions are not copyrightable. Isn’t that correct? Ed Walters: That’s exactly right. In our complaint for declaratory judgment, we spell out some of the law but there’s a lot more law behind it as well. And I think what’s at stake here really are that Georgia regulations are a relatively small library. Fastcase’s 31 million documents, this is a small fraction of them. But it really stands for a larger proposition. This isn’t just an issue for Fastcase and the Georgia regulations as against Casemaker or Law Writer or somebody else. This is a precedent that really will decide which of those two paths we’re on. And if we can succeed in having a federal court declare that private publishers can’t own public law, then that’s a precedent that stands for everybody. Every innovator who’s trying to build something cool on top of the law can use that precedent at least as persuasive to say that nobody can scare them off of it. And if we just licensed it, that really could create a chilling effect. So it says okay, you can use the Georgia regulations but the next innovator who wants to use it has to ask permission or has to license it or has to worry they’re going to get sued. So this is our way of planting a flag in the ground and saying no more. We’re not going to have private publishers of any size push us around suggesting that they have exclusive rights to the law. We’re going to make sure that we and everybody else that comes after us knows loud and clear you can always use public law for whatever you want. Jim Calloway: Well, after a relatively short amount of time, Casemaker announced that they agree the law isn’t copyrightable and they are not going to oppose your lawsuit. What does that mean for this declaratory judgment action? Ed Walters: Well, I don’t know. This is is a statement that they have made to the press and I sort of take them at their word. I don’t know what that means in court. So are they going to answer the complaint? Are they going to not answer at all? Is there going to be some sort of defense? Are they going to try to settle the case? At this point we don’t really know. And as far as I’m concerned, a statement of the press is all well and good but I want to see what happens in court. Now from here, I could imagine a couple of things. But the outcome I would like to see is whether they oppose it or not, I would like to see the court enter an order that says we’re going to grant Fastcase the relief that they’re asking for. We’re going to declare that under the threat of suit, Fastcase can get a declaratory judgment and order that says that publishing the Georgia regulations is not wrong. You’re not doing anything wrong, you can’t be sued. There’s no copyright claim that Law Writer or Casemaker can make against you, there’s no contract claim that they can raise against you. There’s nothing in law that would allow them to sue you in the way that threatened to under this letter. And if the court enters this order, that is a binding precedent in the federal district court in which it’s ordered, and it is a persuasive precedent in federal courts all across the country. I think that would be a good outcome, that would be a real win. But based on the statement of the press, I don’t really know whether there’s going to be opposition or no opposition or something else entirely. Sharon D. Nelson: Well, I think you’re a pretty good chess master, Ed, and I think it was a very smart play. Ed Walters: Well, I think with the threat of suit, honestly, Sharon, we don’t really know where or when they would sue us. We don’t know whether they’re going to try to form shop and find some place that is inconvenient for us or a very pro copyright in government information. And so instead of sitting back and waiting for it, that is where we drew the line. Sharon D Nelson: Well, I think it was a sound and strategic move. But let us pause now for a quick commercial break and then we’ll be right back. Sharon D. Nelson: Not getting enough cases from the internet or the kinds of cases you want? Scorpion can help. Over the last 15 years, Scorpion has helped thousands of law firms just like yours attract new cases and grow their practices. During this time, Scorpion has won over a hundred awards for its law firm website design and online marketing success. Join the thousands of law firms which partner with Scorpion and start getting cases today. For more information, visit ScorpionLegal.com/podcast. Sharon D. Nelson: Welcome back to the Digital Edge on the Legal Talk Network. Today our subject is The Law is Not Copyrightable: Fastcase Sues Casemaker, and our guest is Ed Walters, the CEO of Fastcase. Jim Calloway: So this has been a topic that has been discussed a lot since the law went from being printed on paper by a printing press to digital. Can anyone claim copyright under the law? Is this an unprecedented action? Or where do we go from here? Ed Walters: So I think the original claims of copyright on the law came from times when publishers would really add editorial enhancements to codes or in judicial opinions or regulations. So in the old days on print, if you had the official version of a state statute, they would often include editorial enhancements. A publisher would add a lot to it. Think in judicial opinions about West Editorial headnotes, the summary of judicial opinions. So the history of this is really claiming copyright in this editorial enhancements. Now in those days, frequently commercial publishers were the only way to get access to that law. So if there were editorial enhancements in the official version of the code, then you would see private publishers claiming copyright in the complete code as adorned by the editorial enhancements. So no one would think that you could copy and publish West Editorial’s headnotes, for example, in a judicial opinion. So could you claim copyright on the law under print? Well, to the extent that editorial enhancements were included in the law and not really able to be taken out, then yes, I supposed you could claim copyright in the law, even if the copyright was only good for the editorial enhancements. But that’s not really the world we live in today, because now the law is available online in many cases. And because those editorial enhancements are fewer and farther between, it doesn’t really make sense to make those continued claims of copyright. And yet, we still see it. So the Georgia regs here, for example, there’s nothing editorial on top of the Georgia rules and regulations. They are written by agencies of the state of Georgia. They’re published – all of them – as is in the Georgia regs. So to claim copyright has kind of a heritage, but it’s a heritage that comes from a very different kind of product, one that is written by a publisher about the law. And to be clear about this, we at Fastcase have always said if you want to write a book about the Georgia regulations, you should by all means have copyright on that. If you want to create a different compilation of them and annotate them in a case book, that’s great, and you should be able to copyright that as much as you want. And people should always be able to take copies of the Georgia regulations and make cool products on top of them; sell access to tools that use them. So we’re not copyright extremists, but we have stood consistently for the proposition that the underlying law itself, unadorned, unedited, should always be outside of copyright and should be available to everybody. So here’s an interesting facet of how this happens today. There’s about 8 states that have their law published online by LexisNexis or Westlaw or Casemaker. And in each case, one of those publishers claims some sort of exclusive rights on the publication of those. If you look at the codes of Mississippi or Georgia or Wyoming or Colorado, they’re all published by LexisNexis. And Lexis has certain claims to exclusive use of those state codes. So this is not unprecedented and that’s part of the reason why we feel like it’s very important to make the statement right now and make it available to everybody from a court of law so we know that this claim of editorial control or copyright ability of public law won’t stand before a court of law and no one has to worry about using it. Sharon D. Nelson: Isn’t there actually another case in Georgia right now over whether the Georgia code can be copyrighted? Ed Walters: Yes. So the legislature of Georgia is suing PublicResource.org, which has taken the official Georgia code, scanned it and put it online. The case there is similar but different in a couple of critical respects. So the official Georgia code, the statutes of Georgia, as published by LexisNexis actually have annotations after the codes. And those annotations are prepared by LexisNexis. Now the Georgia legislature has declared Lexis’s compiled Georgia code as the official code of the state of Georgia. So there are many copyright scholars who believe that once the legislature designates it as official, even if there’s editorial enhancements, it’s nonetheless in the public domain because there’s only one official code and that official code always has to be owned by the people. There’s a lot of interesting law around that. It’s a little bit different from our facts. In our fact situation, there’s no editorial enhancements, it is just the native law itself. I think that PublicResource.org has a pretty good case here to make. When you designate the code as the official code, there’s really no other way to get it; there’s no other official law of the state. And by the way, everyone agrees that the state of Georgia can’t claim copyright on the Georgia code by simply hiring an outside publisher to do the work as an agent for hire. They can’t get any more copyright for the Georgia code by using an outside agent as they could themselves. That doesn’t really change anything. So I think that’s really an interesting case, in some ways a harder case. As I’ve said a couple of times, I think our case versus Casemaker is a slam dunk. This is not a hard case. It’s very well established in law that law isn’t copyrightable. And if there’s some contract between Law Writer and the Georgia secretary of state, it doesn’t create any obligations for us or anybody else who wants to use the law. So I think both cases will be very interesting to watch. The PublicResource.org case is a little bit ahead of ours. I really like their chances in that litigation. And then ours might be on some shorter track depending on what Law Writer does here. But related issues, close by courts, both in Georgia, would be fascinating to see the outcome. Jim Calloway: Well, that is certainly very interesting, Ed. Let’s pause for a commercial break and then we’ll be right back. Looking for a process server you can trust? ServeNow.com is a nationwide network of local, pre-screened process servers. ServeNow works with the most professional process servers in the country. Connect your firm with process servers who embrace technology, have experience with high volume servers and understand the litigation process and rules of properly effectuating service. Find a prescreened process server today. Visit ServeNow.com. Jim Calloway: Welcome back to the Digital Edge on the Legal Talk Network. Today our subject is The Law is Not Copyrightable: Fastcase Sues Casemaker, and our guest is Ed Walters, the CEO of Fastcase. Ed, here in my state of Oklahoma, I know they’ve paid close attention to copyright for many years. Our court adopted public domain citations and then actually paragraphed numbers on each opinions to get away from a claim that was later determined invalid by one publisher that the internal page numbers were copyrightable. Our courts now, its own publisher, and publishes the official publication is actually our court’s website. Are you familiar with any other states that are making those kind of moves to make it clear who really owns the law? Ed Walters: Yeah. Well first, let me just say that Oklahoma is really the model for the country. The Oklahoma Supreme Court Network, OSCN, was really one of the first efforts in the digital age for a court system and for a state to reclaim the publication of its judicial opinions. And Oklahoma has really been the model for more than a decade right now in self publication. This has traditionally been the function of the state. Every state had its own reporter of decisions and there was no question that no one owned it. But the regional reporters by West Publishing became so popular, many states stopped publishing their own reports and then we ended up with these questions about whether the output of West Publishing is copyrightable or not or to what extent it’s copyrightable. Oklahoma is really a pioneer in that self publishing model. There are a couple of states that are taking it back. If you look at Louisiana or Illinois or Wisconsin, there’s a number of states now that are moving to media neutral citation with the idea that you should be able to cite a case as soon as it’s handed down, not wait for it to be published in books and that no one can own the pagination. I know the state of Colorado is also really making some pioneering efforts here as well to do a better job of self publishing the law and to have more control over it. There’ll be some interesting things to see there going forward. But I think one of the great things about this digital age is that the means of production are less expensive than ever. It’s becoming more and more possible for states to publish their own laws again. Once we’re freed from the expense of printing it out on paper and binding it and storing it and shipping it and fulfilling it, once you can do that kind of publication digitally, it becomes less expensive. Another good example of this is Washington DC where the general counsel of the DC counsel at the time, Dave Bennett a couple of years ago said there really should be an unadorned, open copy of the DC code. And he compiled that and made an opensource version of the DC code which really is a model. There’s still an official private publisher who publishes the DC code in print and they still make a lot of money off that publication. But in addition to that, the one that has the annotations and editorial overlay, there’s also an unadorned, open public version of the DC code that anybody can use. And now there’s all these great websites that are building on top of the DC code including by the DC government itself. That, to me, is really the model. There should be an open, free version of state statutes and judicial opinions that anybody can use. And then if publishers want to add to it and print it out or compile it in different ways or really add value to it, they should do that all day long and they should be able to charge for that just as the DC government has done in the open DC code. Sharon D. Nelson: So, Ed, what happens to this case in Georgia? What’s next? Ed Walters: Now we wait. The time is coming near. By the time this airs, it may have already passed for Law Writer to answer and we’ll wait to see what they say in their answer. If we take seriously what they said in the press, they might not answer at all. In which case we’ll ask the court to write an order declaring that the law isn’t copyrightable. You can’t create through private contract copyright-like rights that excludes others from using it. And if that’s the road we’re on, then I would hope the court would issue an order saying exactly that. And that would be great. That would be a precedent that anybody could use anywhere in the country as persuasive authority. I think the law’s on our side there so I’m optimistic. Or there could be an answer that says we have a contract and you’re going to have to prove your case before the court. And if that’s the case, then we’re in litigation. And you know, I’m a litigator. That was what I did before I started Fastcase. Sharon D. Nelson: I hope somebody on the other side looked that up. Ed Walters: I kind of miss litigation! I was really good at it when I did it. So if we’re in litigation, that’s great. I really think that there is something noble about doing the right thing in litigation and standing up for what you believe in and fighting for what’s right. Not just for yourself but for everybody. So if that’s the world we’re in, bring it on. Sharon D. Nelson: Alright! Well, it certainly sounds like a great idea doing this; I like the idea of open law as an aspiration for all of us. And I very much appreciate the fact that you’re carrying the flag in this particular cause. It is a noble cause and I think that there are very few people involved in the legal profession who would disagree with that. So thank you for joining us today, we’ve really enjoyed the conversation Ed. Ed Walters: It is so fun being on the Digital Edge! Thank you Sharon and Jim for having me today. 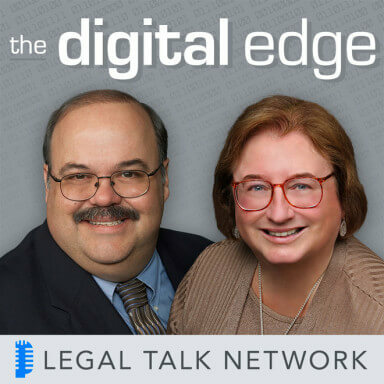 Sharon D. Nelson: That does it for this edition of The Digital Edge, lawyers and technology; and remember, you can subscribe to all the editions of this podcast at LegalTalkNetwork.com, or on iTunes. And if you enjoyed our podcast, please rate us on iTunes. Jim Calloway: Thanks for joining us. Goodbye Ms. Sharon. Sharon D. Nelson: Happy trails, cowboy. Advertiser: Thanks for listening to The Digital Edge, produced by the professionals at Legal Talk Network. Join Sharon Nelson and Jim Calloway for their next podcast covering the latest topic related to lawyers and technology. Subscribe to the RSS feed on LegalTalkNetwork.com or in iTunes.